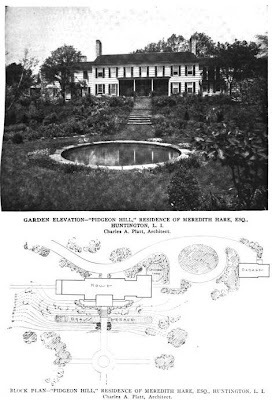 'Pidgeon Hill', the estate of Meredith Hare designed by Charles Platt c. 1916 in Huntington. 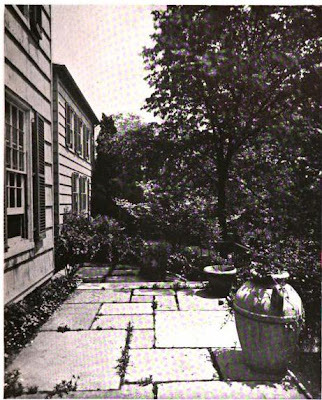 Platt along with Ellen Shipman designed the terraces, driveway and flower gardens. Hare was an attorney who graduated from Yale and Cosmopolitan University Law School. 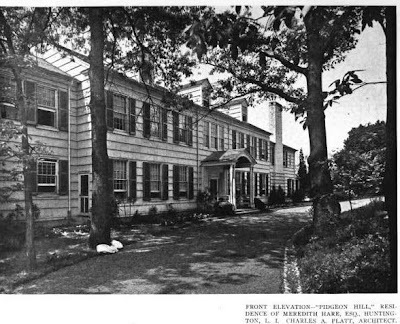 The house was demolished sometime in the early 1960's to make way for an incoming development (not sure why SPLIA and Spinzia say it is extant). Click below to see 'Pidgeon Hill' intact and still standing in a 1953 aerial shot. 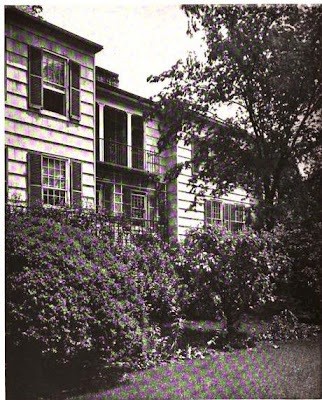 Pictures from Architectural Record, 1920. 'scuse me but you haven't lived in colonial new england i guess. another boring neo-colonial. i'm sure the shipman garden went a long way to rescue it but still.... give me CPH or trumbauer anyday. 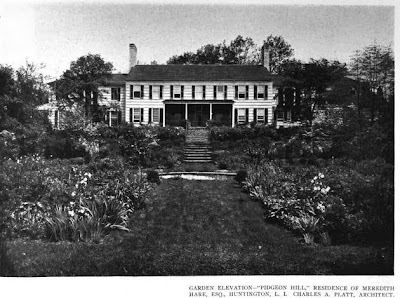 you want to see a real house - look up the Carhart mansion on the "realestalker" blog. Oh, Pack Rats, my fellow Mainer, I do disagree, pink pants or not. I love the colonial revival adaptations---and this is a great one...new england/old long island forms, but much larger scale. Love Trumbauer, but have always found CPH awkward. addendum - i take it this must have set on quite a tract of land as the farm group is a long ways from where google sez the house was. maybe they pulled it down for abortion right behind the mark on google. and, this is another one like a couple of others you've posted recently that say they demolished the house for development but there's no development where the house was. my hint to the developers - leave 'em the heck alone. Yes the house sat on over 100 acres. why is it that so many of Platt's houses have not survived? They seem to be the absolute epitome of a perfect country house! Maybe because they had too much land most of the time? I have never lived in a colonial New England house but I think this one had enough variation on the original type to make it interesting. The big Stair Hall opening to the terrace must have provided a very gracious entrance, certainly a surprising one at that. And the Library was huge. Also there were a couple of sleeping porches as well as a big service wing. 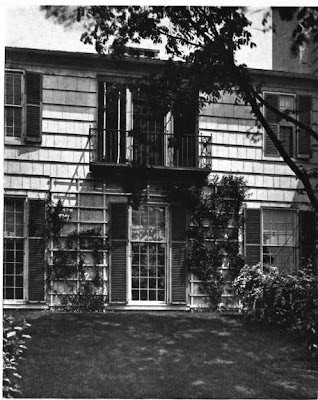 Although the exterior portrayed the simple shingled colonial theme, magnified a few times, I find it far from boring. Can anyone make out the name of the room to the west of the main entrance? It has a fireplace and an adjoining bath and closet. (There's a Butler's Room at the other end). I live in one of the original cottages of "Pidgeon Hill" Meredith Hare estate. (There are two that were guest quarters built for the Hare's to live in while the mansion was being built. It survives and is flourishing. It sits on 1.2 acre site. I have all the original doors, floors, windows storms, shutters, siding and hardware. I am amazed at the workmanship everyday. 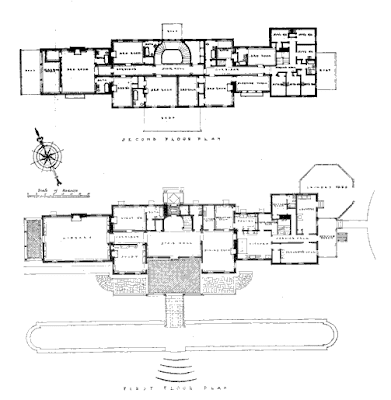 I have the original floor plans thanks to Columbia U.
I used to work for a Mr. John Goodwin(originally from CT). I recall him mentioning that Pigeon Hill was his childhood home. Does anyone have any information on this? From what I have researched through news clippings, Mr. John Goodwin, was the son of Mrs. Meredith Hare, I have pieced together that Mr. Meredith Hare became ill with influenza(or some other illness of the time), and they sold the Hare estate and moved out west(to New Mexico ? ), I think it possible that Mrs. Hare remarried and became Mrs. Goodwin. John Goodwin and his Mom were very artistically inclined, I believe they were both acclaimed painters, Do you have any info for me on that topic? Of course , I could be wrong about this, also I found some info on Mrs. Meredith Hare was quite scandalous(perhaps younger than Meredith by some years?) And they ran off to the Caribbean to be married. I am still confused by the name change, it is not really documented in new york.